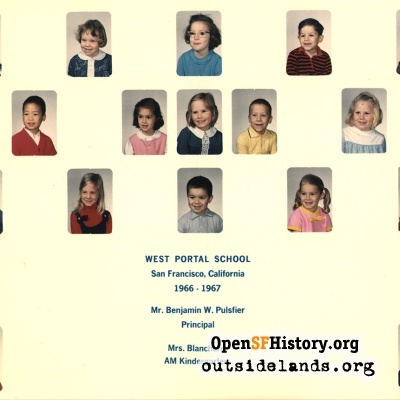 < You have asked several questions about the picture of the school. 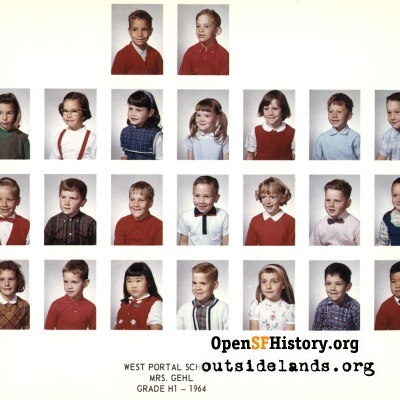 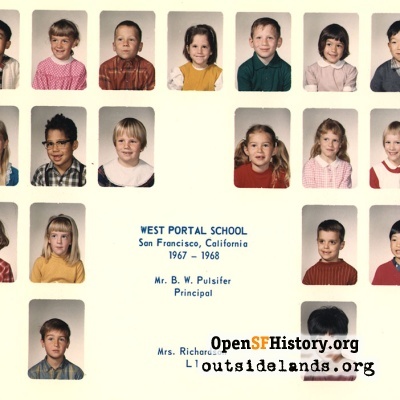 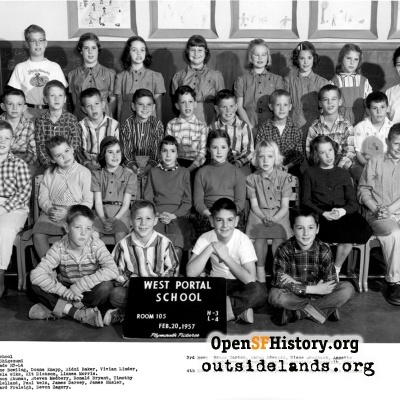 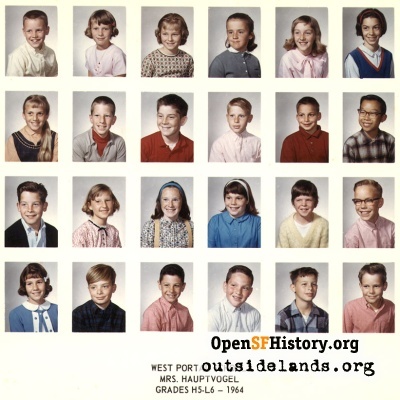 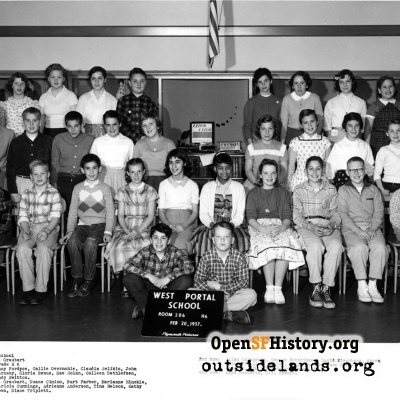 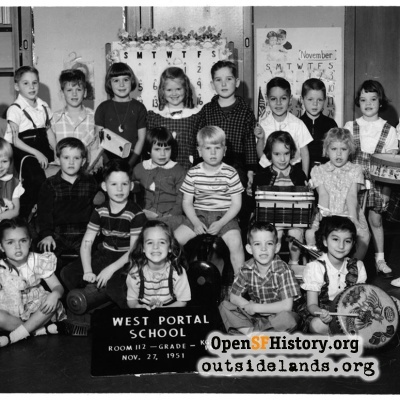 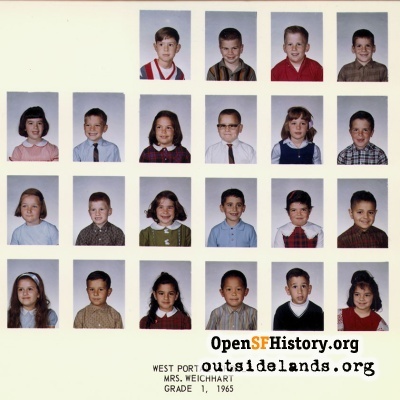 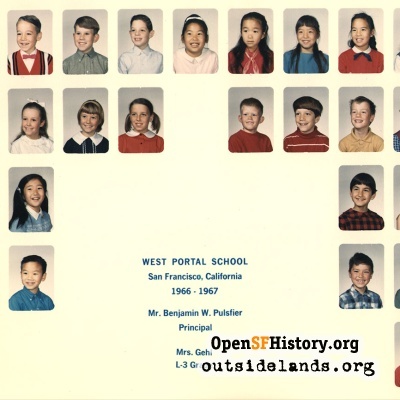 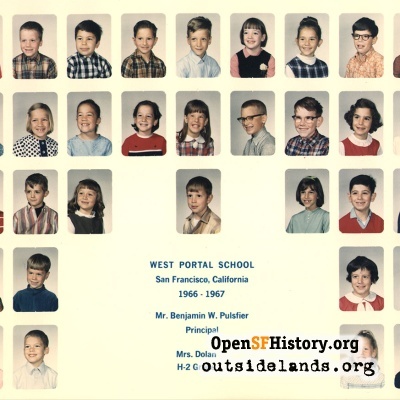 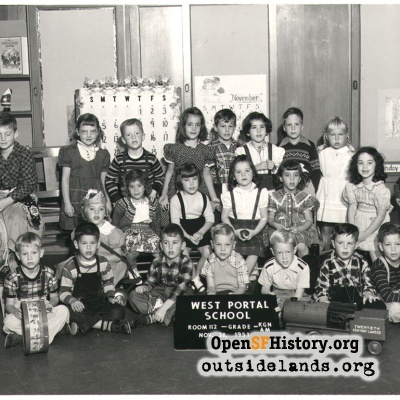 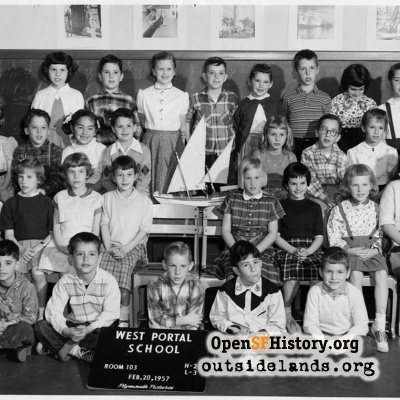 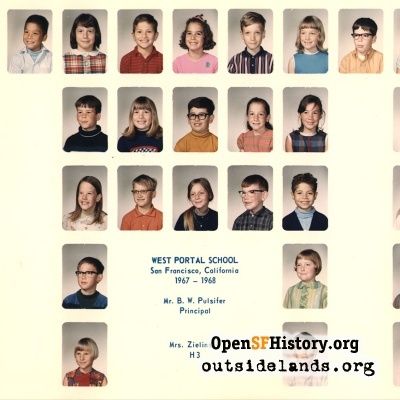 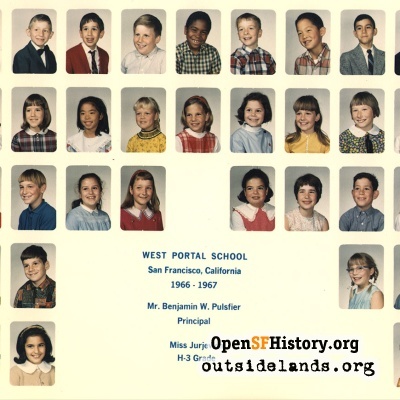 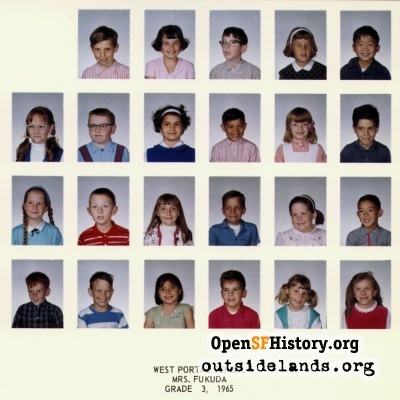 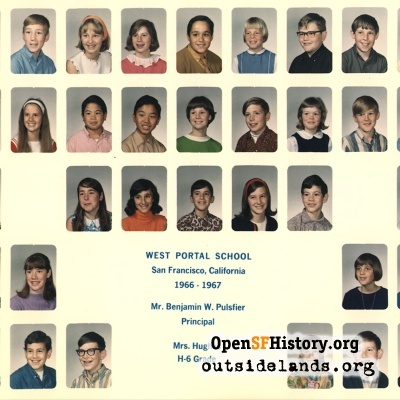 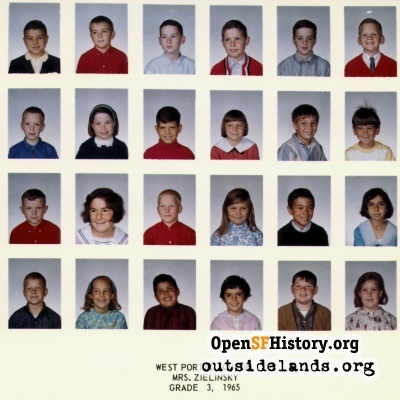 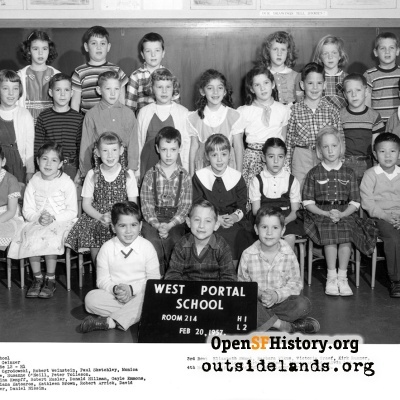 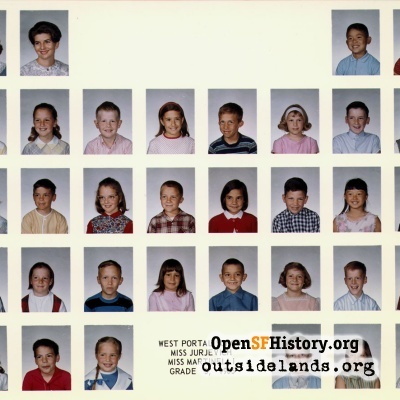 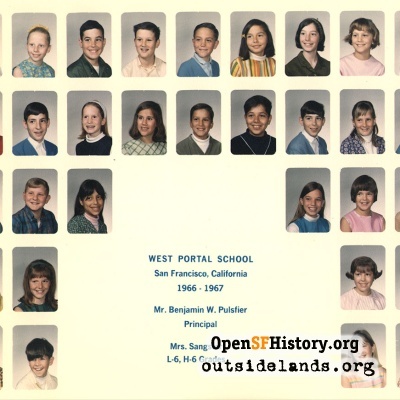 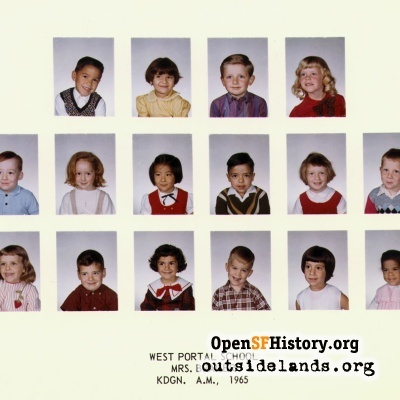 Your two West Portal School "experts" (me and John Allen) have conferred to fill you in on the details! 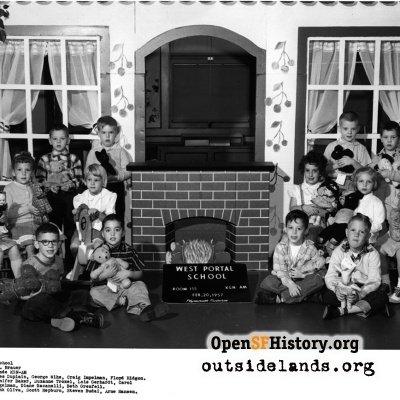 The school was built at a time when the area had many young families, thus the need for two wings. 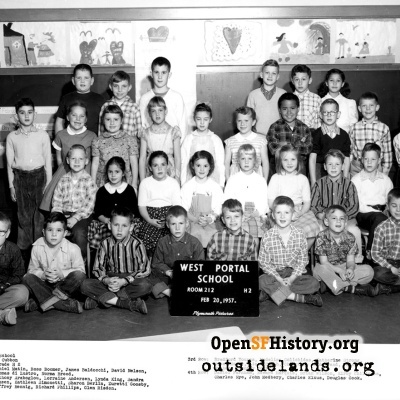 John writes, "The wing on the right (now gone) was used for K-3 classes. 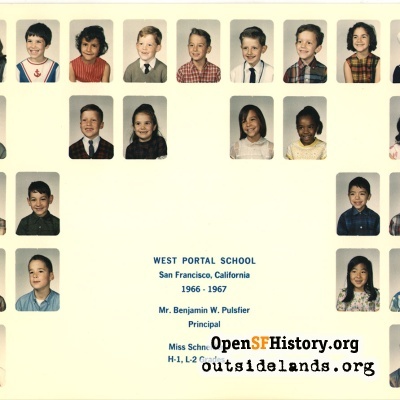 I recall it being called the "primary wing." 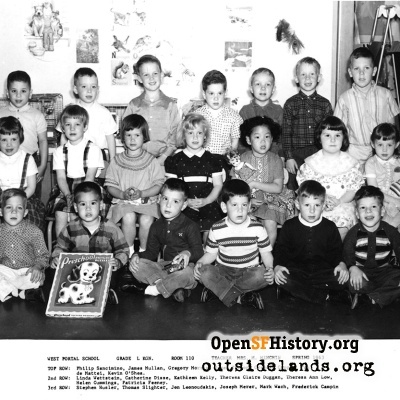 Behind the kindergarten classrooms [in the two bay windows in the right building] were at least two more class rooms on each side with the same arrangement on the second floor. 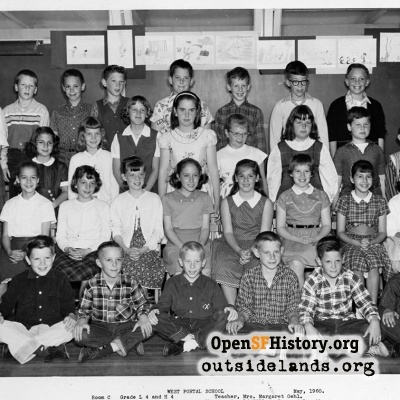 The first grades were on the lower floor and second and third grades on the upper floor. 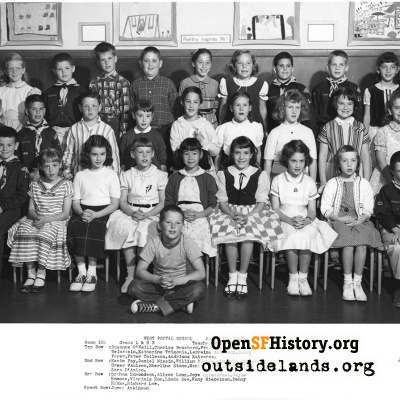 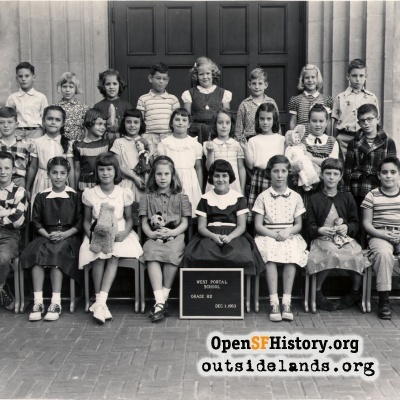 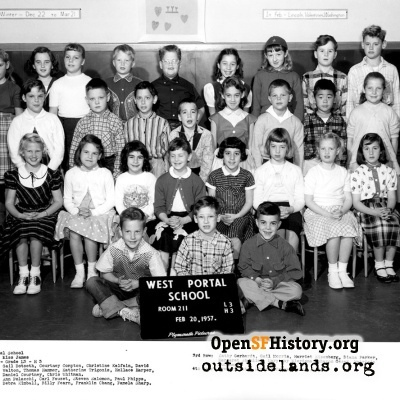 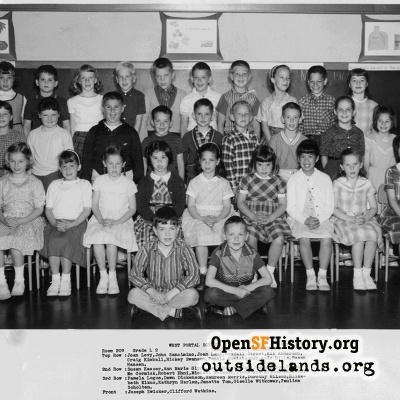 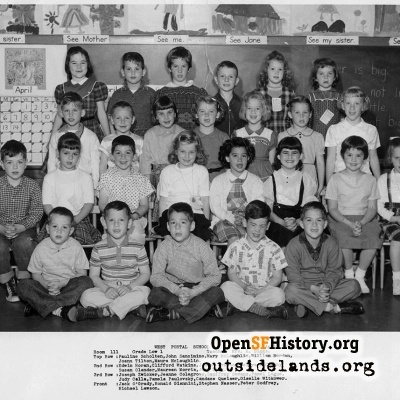 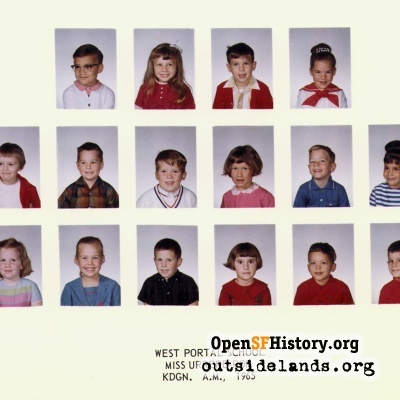 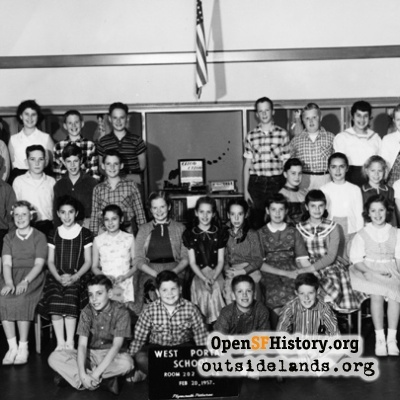 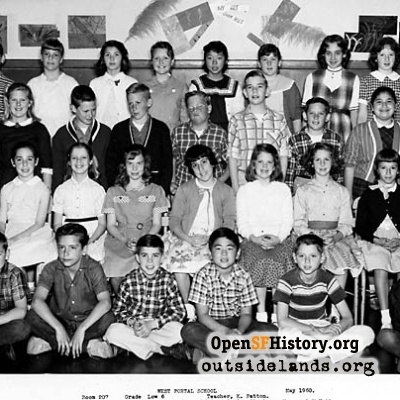 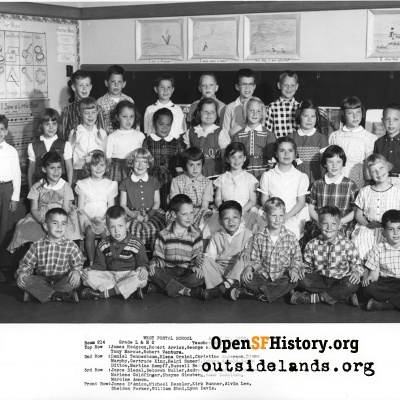 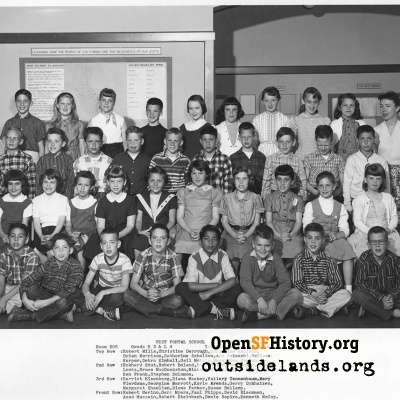 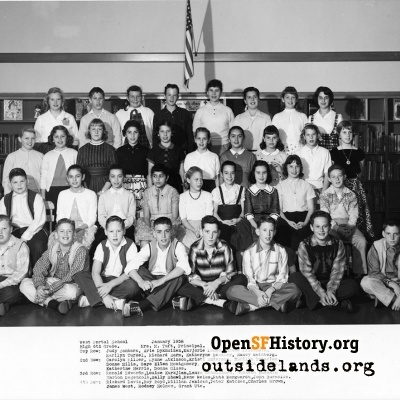 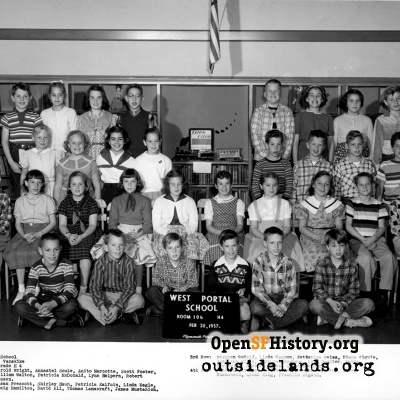 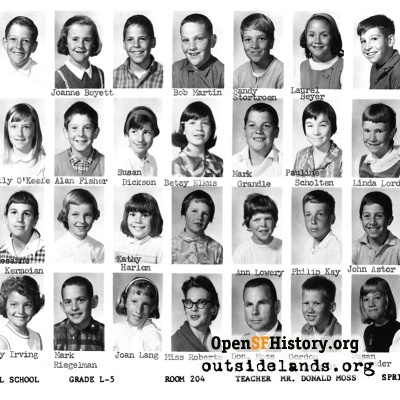 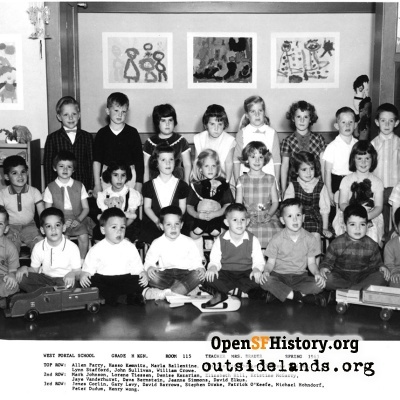 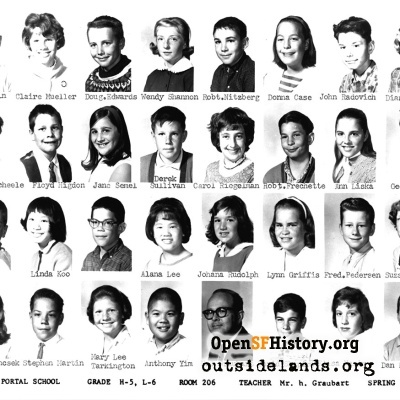 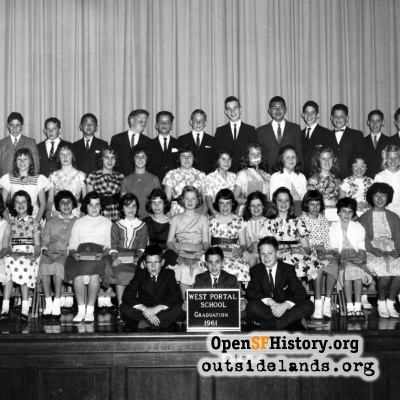 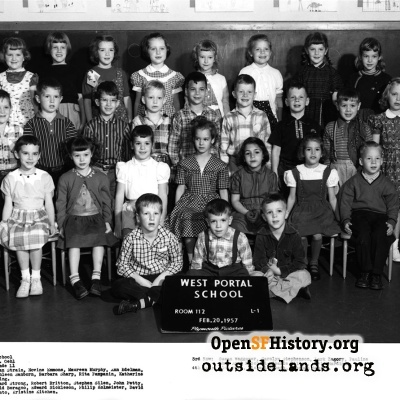 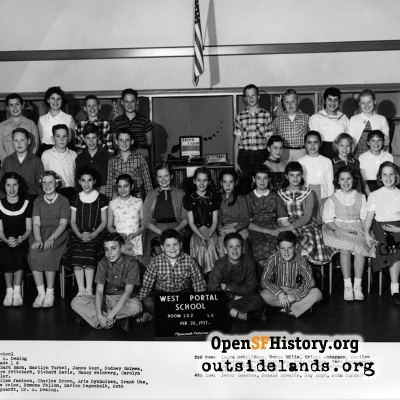 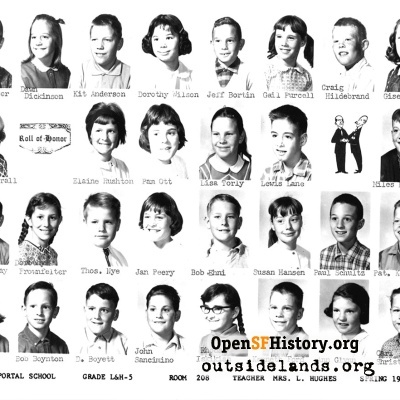 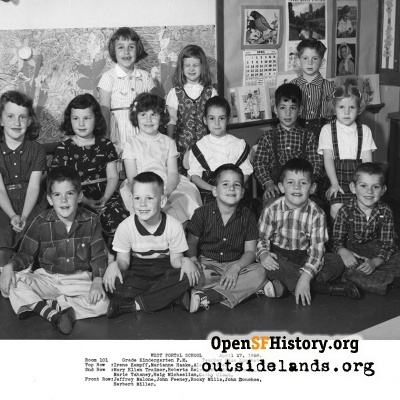 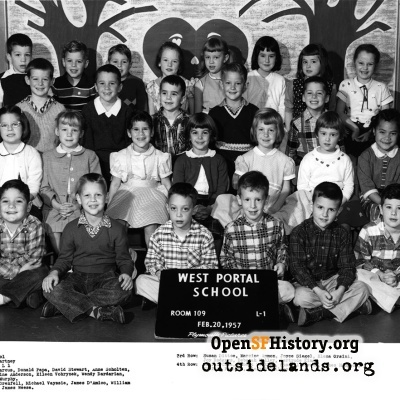 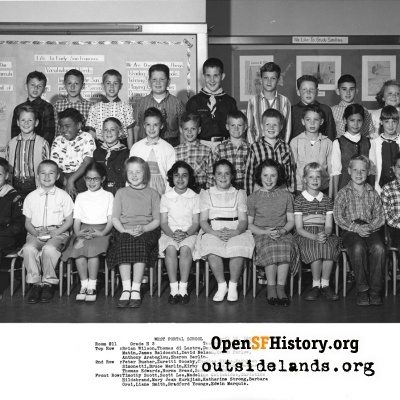 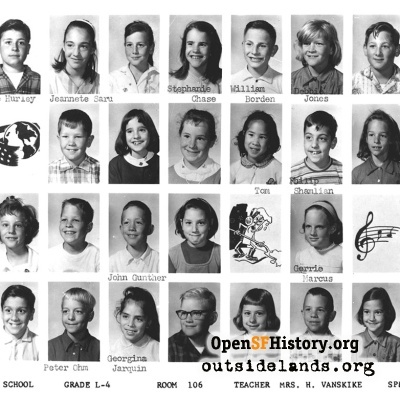 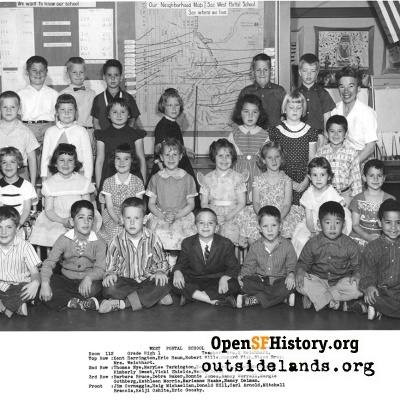 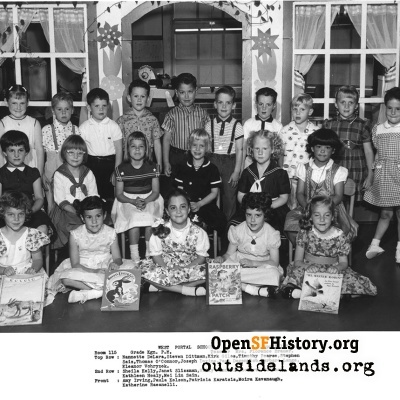 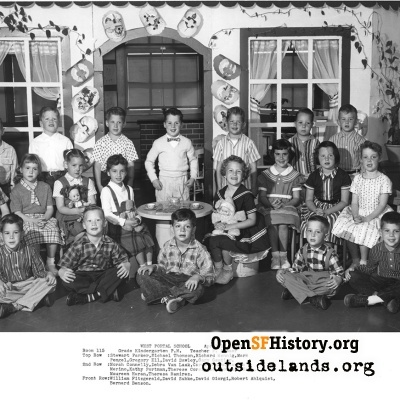 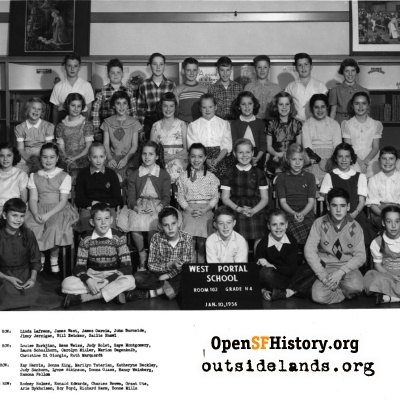 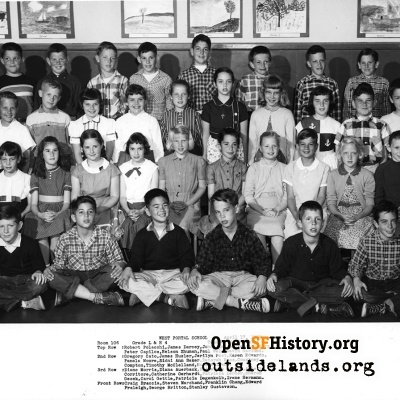 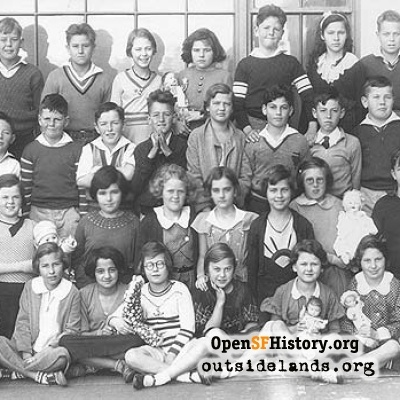 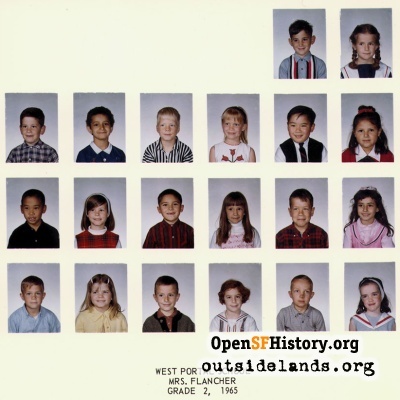 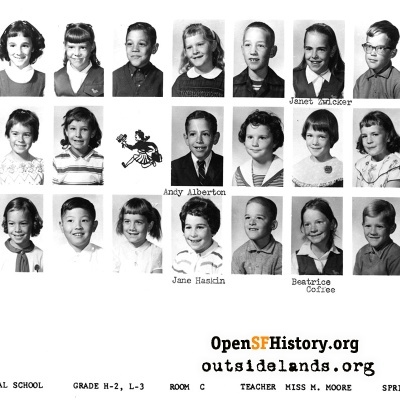 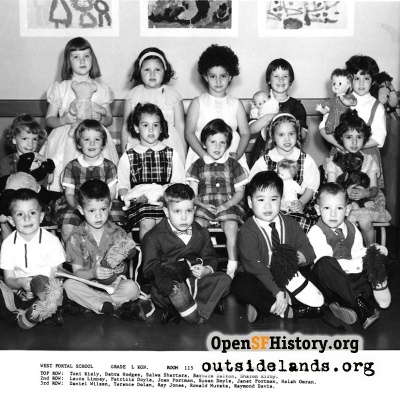 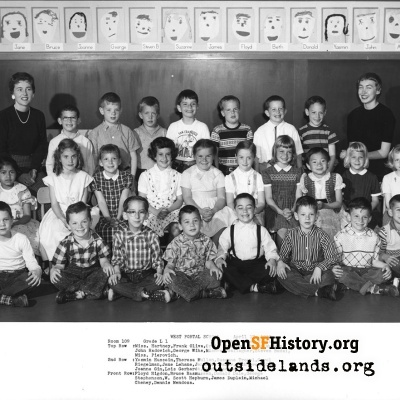 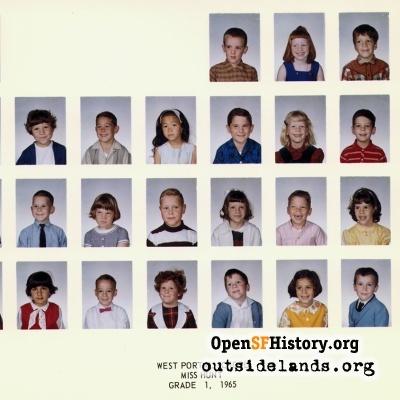 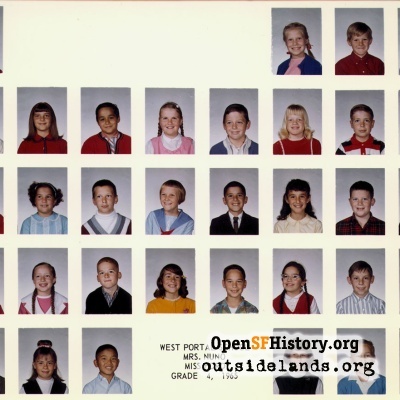 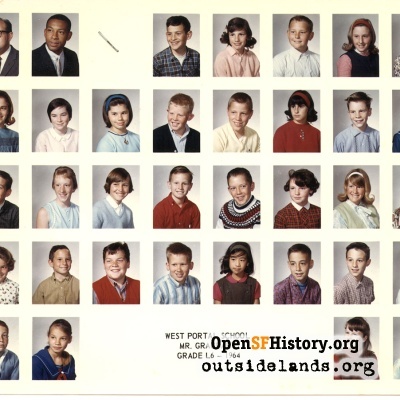 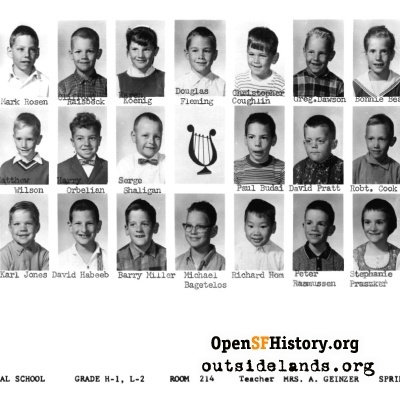 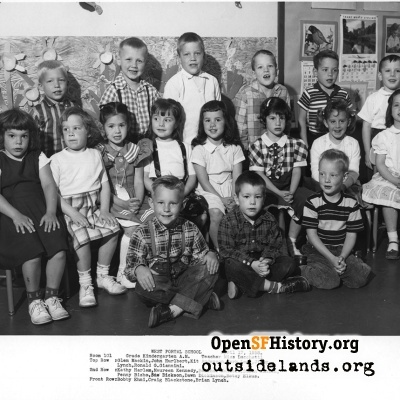 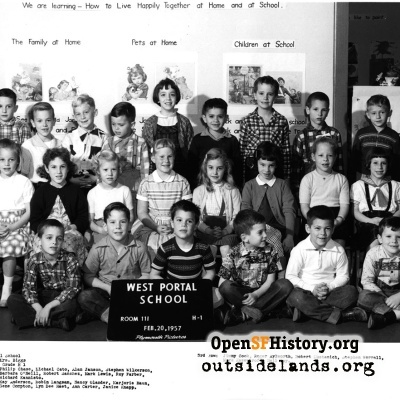 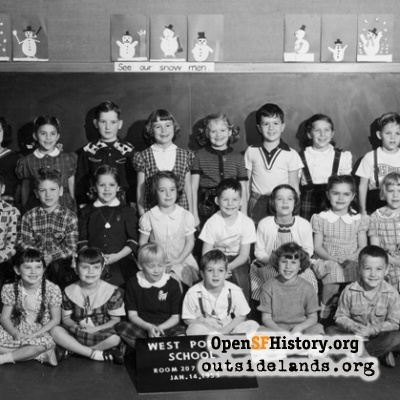 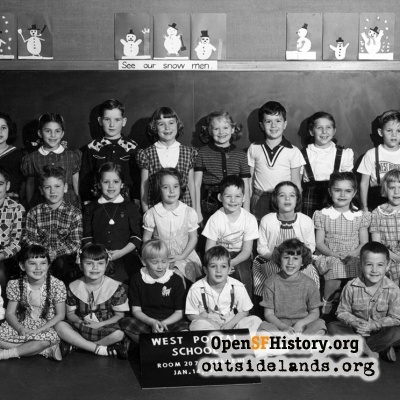 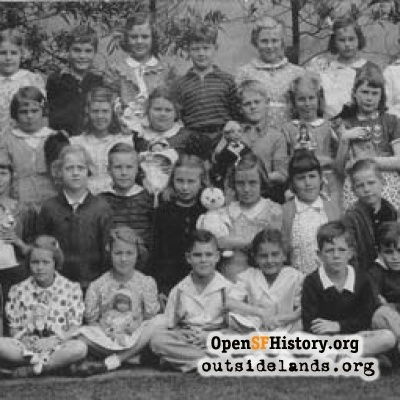 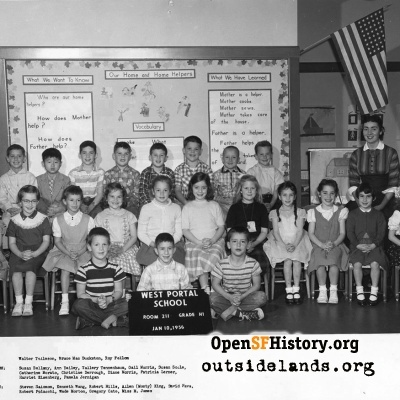 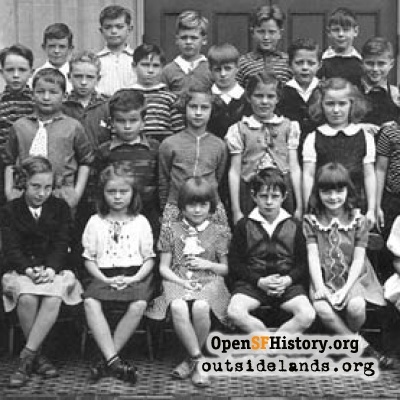 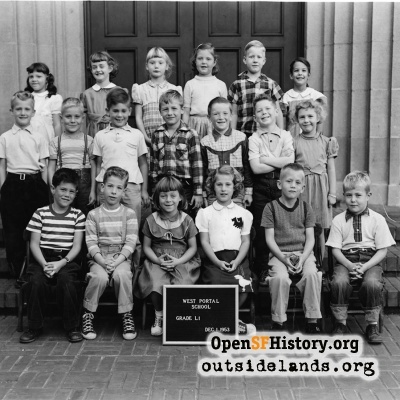 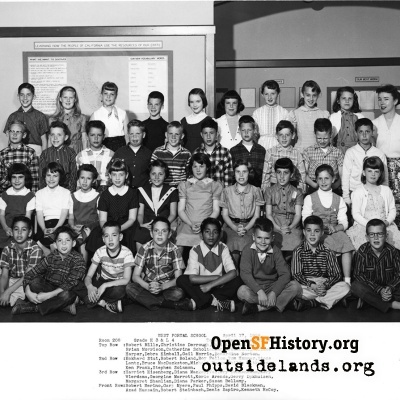 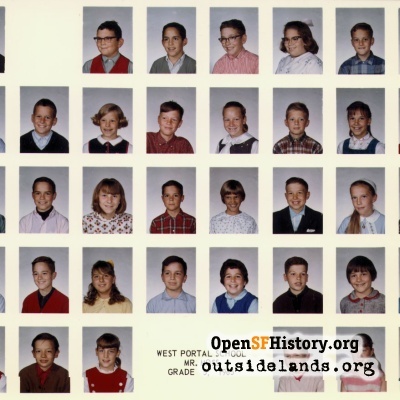 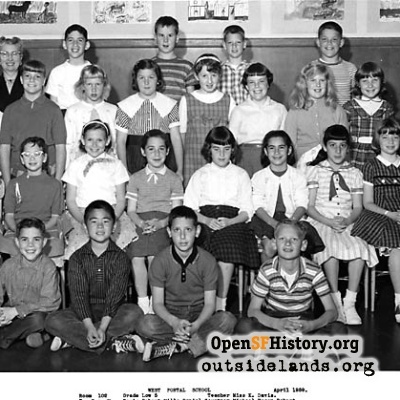 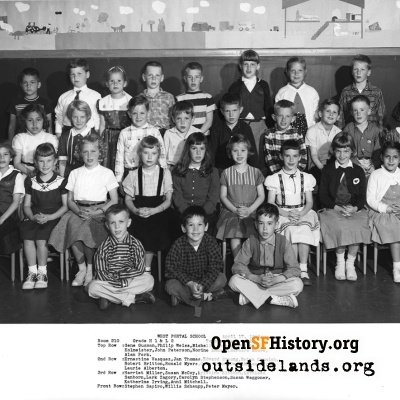 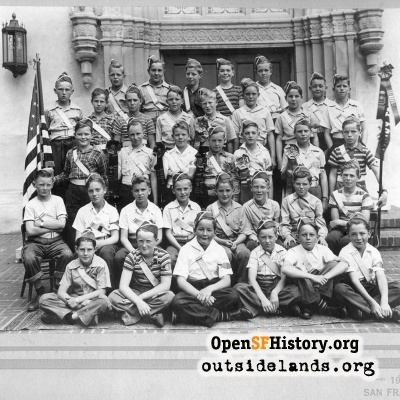 My third grade class, where the photo was taken, was on the west side of the building. 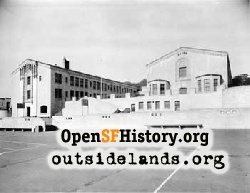 The building on the left housed the upper grades, the office, the nurse's room and the cafeteria. 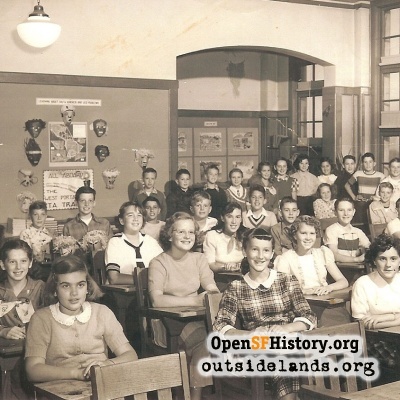 On the lowest level below the class rooms was the furnace (boiler) room and rest rooms. 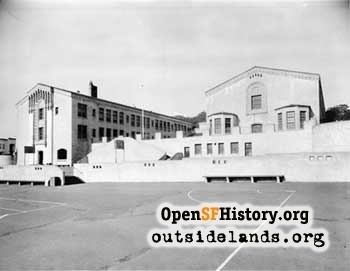 Joining the two wings along the back, not visible in the picture, was the auditorium and a multi-purpose room. 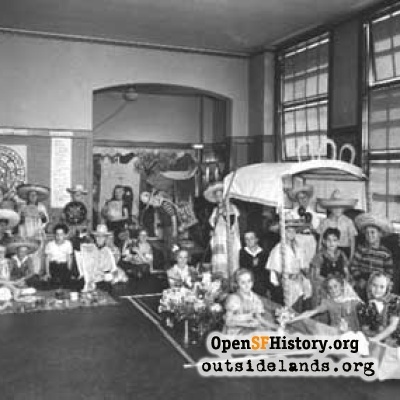 "The windows in the foreground below the kindergarten classes were rest rooms with part of the upper schoolyard above them. 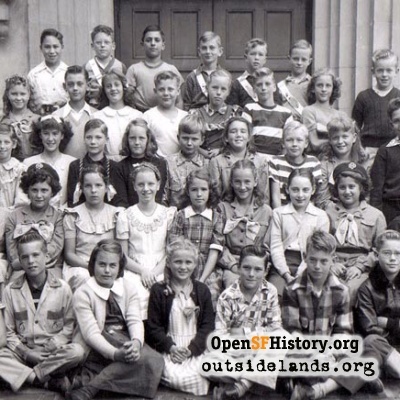 There was one more level of school yard below what is shown in the photo, making four in all. 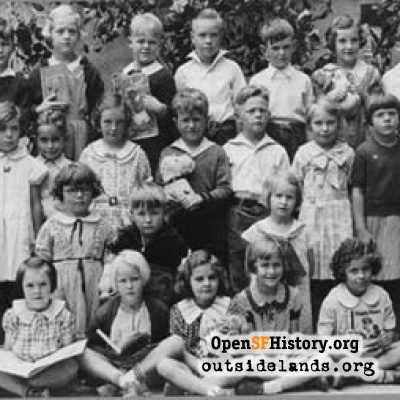 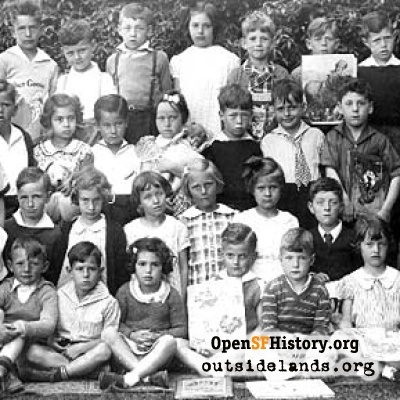 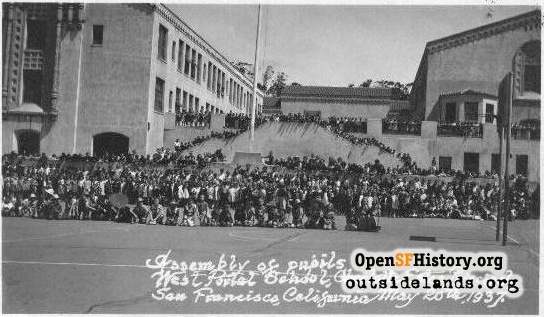 The school probably had a smaller enrollment when the building on the right was removed. 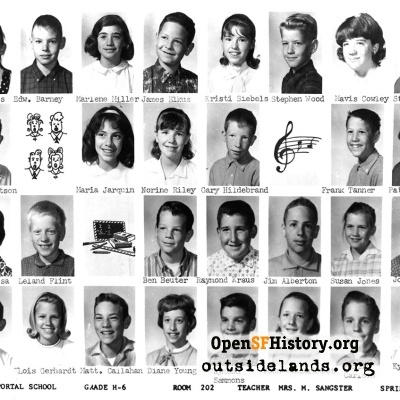 When we were there, I believe, there were three classes for each grade, two September to June and one January to January." 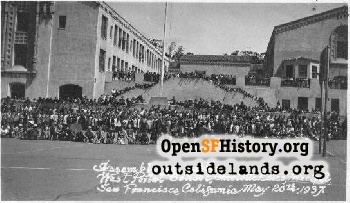 Rumors about the east wing placing too much stress on the MUNI tunnel below have also been heard. 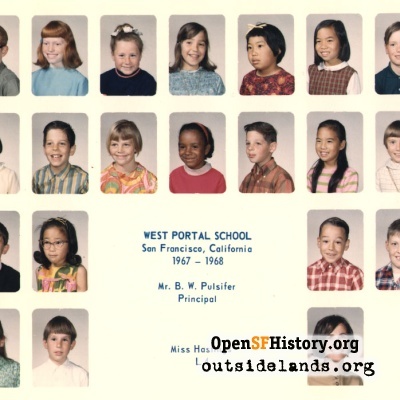 Perhaps the building came down during the 1970s West Portal tunnel renovation? 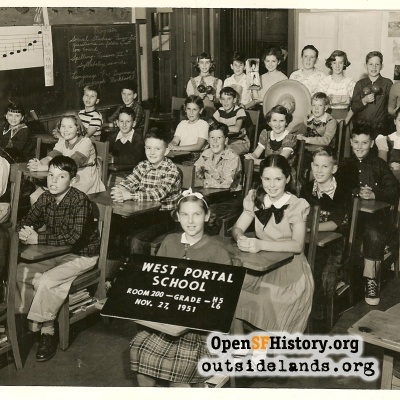 Today West Portal School still has its beautiful auditorium, and from 2006-2008 many renovations to the building and yards have been made to make it more accessible and attractive.